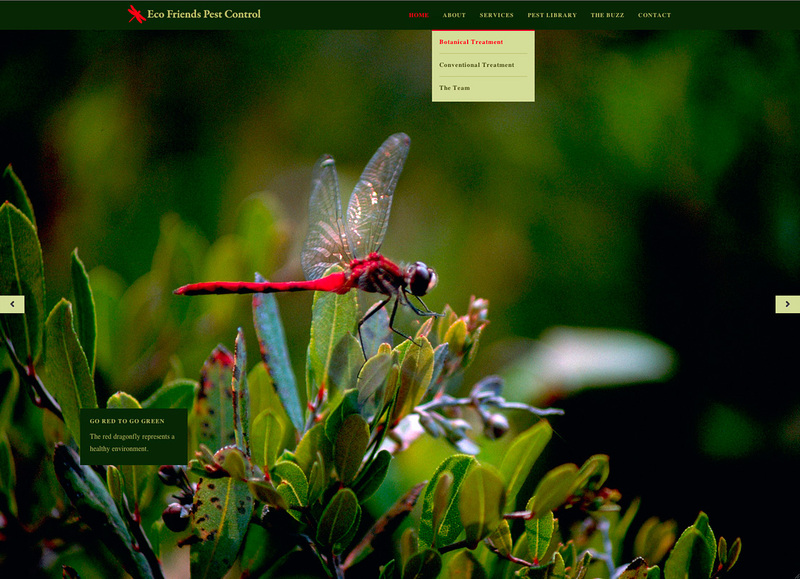 The homepage for Eco Friends Pest Control with a supersized slideshow. Eco Friends Pest Control has a new website! I designed this site a year ago, but my client needed time to work out their copy and other details. I spent the last couple of weeks implementing all the changes, and now it’s ready for public viewing. These last two weeks have not been easy. In the past year, the developer and WordPress had issued numerous upgrades that caused a lot of problems with my original design. I basically had to rework everything. Most of the drama occurred in the backend — things that the public never sees. Perhaps that’s why they use the term “backend.” I still have some bugs to work out (no pun intended), but for the most part, it’s finished, and I’m happy with how it plays. Check the site out and seriously consider using this wonderful little company for all your pest control needs. They will only use products that are natural and completely safe for your home, garden, and business.